The typical central air conditioning system is a split system, with an	outdoor air conditioning, or “compressor bearing unit” and an	indoor coil, which is usually installed on top of the furnace in the home. Using electricity as its power source, the compressor pumps refrigerant	through the system to gather heat and moisture from indoors and remove	it from the home. 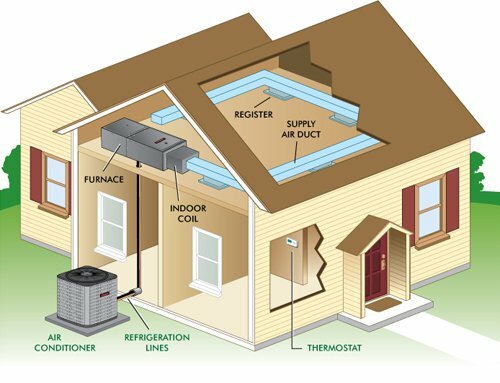 Heat and moisture are removed from the home when warm air from inside the	home is blown over the cooled indoor coil. The heat in the air transfers	to the coil, thereby “cooling” the air. The heat that has transferred to the coil is then “pumped” to	the exterior of the home, while the cooled air is pumped back inside,	helping to maintain a comfortable indoor temperature. Central air conditioning can also be provided through a package unit or	a heat pump. Indoor comfort during warm weather – Central air conditioning helps keep your home cool and reduces humidity levels. Cleaner air – As your central air conditioning system draws air out of various rooms	in the house through return air ducts, the air is pulled through an air	filter, which removes airborne particles such as dust and lint. Sophisticated	filters may remove microscopic pollutants, as well. The filtered air is	then routed to air supply duct work that carries it back to rooms. Quieter operation – Because the compressor bearing unit is located outside the home, the	indoor noise level from its operation is much lower than that of a free-standing	air conditioning unit. We look forward to enhancing the level of your indoor comfort control. Find out the top 10 reasons that makes us different. Start saving by taking advantage of our online discounts.